This week a group of union activists and veterans from “Unite Here” are calling on the Marine Corps to cut ties with the Ultimate Fighting Championship (UFC), a mixed martial arts contest. On Thursday, the group delivered petitions to recruiting stations across the country, making a push for the Corps to disassociate and end sponsorship of the UFC. In recent weeks, other military branches have been urged to cut sport sponsorship ties. In June, the Army announced it would no longer sponsor NASCAR following pressure by lawmakers in support of a House amendment to the 2012 defense spending bill. The proposal would make military sponsorship of sports illegal. In Monday’s edition of Marine Corps Times, Gina Harkins will have a report about the relationship between the Marine Corps and the UFC. What do you think? 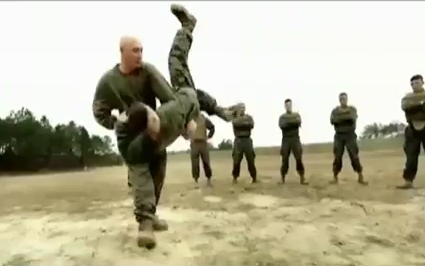 Should the Marine Corps cut ties with the UFC? The Union is PO’d because Dana Whites business partners run the only non-union casino in Vegas. It has nothing to do with any of the crap in the letter to the CMC. Instead of recruiting from UFC fans, maybe the Corps should start advertising on Berkeley’s website…see the ROI on that investment . Bunch of political BS.